Cat-meo. And, no, I can not play the box guitar. Someday, but for now it's purely decorative. I had a busy Saturday. It’s funny how things happen. 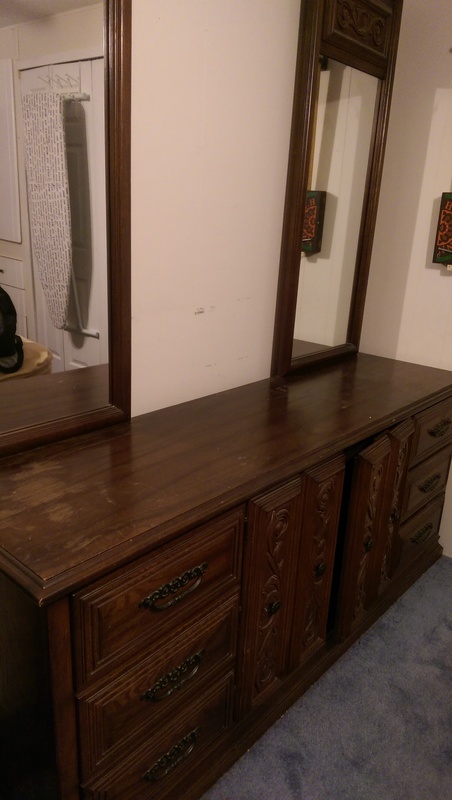 I had a big old dresser that I was trying to part with for months. Nothing wrong with it, really, but with all the instruments, things were getting pretty cramped. I was starting to get claustrophobic. Plus, no room for yoga. 6 ft long. Solid wood. Came with the house. Now, I’m not overtly strong, but I’m not a total wimp, either. In my house, I wear the pants (which basically means that the manual labor is all on me), so when I say I couldn’t budge it a centimeter on my own, it gives you an idea of how much weight there is to it. Two grown men had to dismantle it in order to get it light enough to move. It’s funny how things happen. I listed it months ago. Roomie and I joked that I couldn’t give away a piece of solid wood furniture for free. Then, suddenly, I got three serious hits all at once, and it disappeared less than 24 hours later. It had to go for two reasons. First, because there was literally not enough space between the dresser and bed in which to do yoga, just a thin strip of carpet wide enough for the drawers and my knees. But, even more so, because there was literally nowhere to put guitars except on top of it. 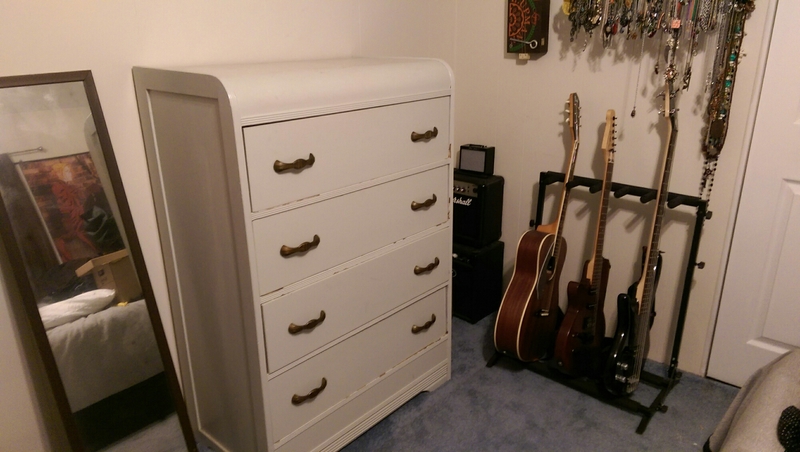 With the big dresser gone, I was free to take my smaller (but still big, old vintage) dresser out of the closet. With my closet now free for hanging things, and my floor space greatly improved, I was able to line up a dedicated guitar corner. (The ukes are on the opposite wall.). Making yourself a guitar corner, I figure, is a great way to ring in a new year. 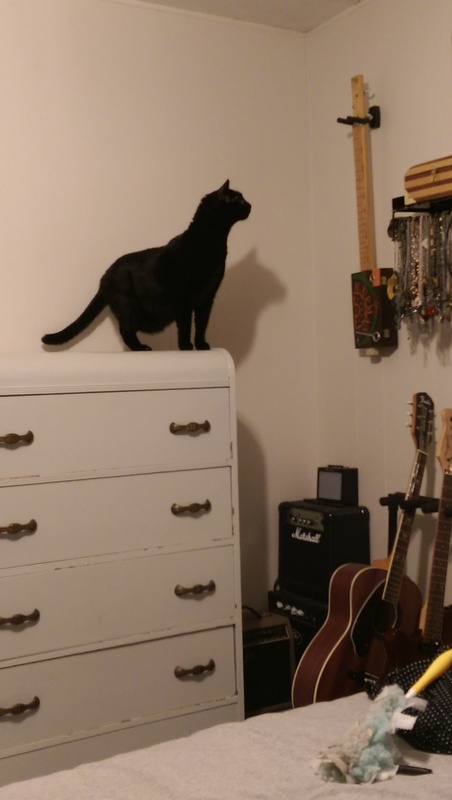 Besides, the cat loves challenging himself to jump up there! Now, I just need to figure out what to do with all of the accessories (cables, pedals, strings, etc). Right now, they’re in a jumbo tote bag. Any ideas? How do you guys organize all of your little stuff? Until next time, taking joy in the newer, more open space, and having my guitars somewhere I don’t have to move them to get socks. Previous365 (Version 2) – and test driving a new toy. NextSo, Let’s do a cheapo mic comparison.